Are you looking to realize greaterÂ self-loveÂ andÂ personal power? 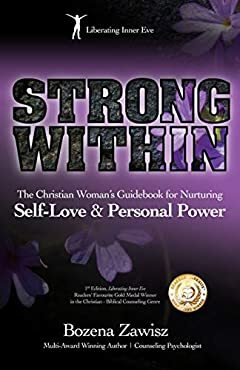 Strong Within: The Christian Womanâ€™s Guidebook for Nurturing Self-Love and Personal PowerÂ will take you on a journey of personal growth. It will help you to address the most commonly encountered personal, social, and historic challenges that women face on daily basis,Â against the background of an empowering exploration of the Genesis account of Adam and Eve. Each chapter will give you a fresh perspective on themes that are relevant to womenâ€™s everyday lives and Christian identity, such as how you experience your self-worth, relationships, or lifeâ€™s purpose. Each chapterâ€™s exercises and reflections will guide you in transforming your beliefs, thoughts, and feelings, to stay STRONG WITHIN!